Are you thinking about purchasing a used upholstered sofa or chair? How much should pay for it? Will you have it reupholstered, or will you be using it as it is? When going out to buy used furniture, the buyer should keep the following three values in mind, the true value, the value to the owner, and the value to the buyer. This knowledge will help to negotiate when you want to purchase used furniture. The true value is based upon the market value of the item. How much would a number of reasonable buyers pay for the item. In some case, the true value may be based upon the appraised value. But for most common used furniture, there is no appraised value. To prepare yourself for purchasing used furniture, you need to have at least a vague sense what used furniture is worth. Here are some ways to educate yourself. List the type of furniture that you will be looking for. Then look through the classified section of the newspaper to see what similar furniture is selling for. Look at online advertising, such as Craig's list. You may not be willing or have the time and resources to go out and look at each piece of furniture, but look at as many as you can in person. One of the best places to look at used furniture is at second hand stores and thrift stores. This will give you an idea of what prices are being asked for what condition of furniture. Keep a list of the prices you have found for each type of furniture. The value that the owner assigns to their furniture may vary greatly depending how badly they want to get rid of the item, how much sentiment they have in the item, how much they remember they paid for it. The owner may value it a lot more or a lot less than the true value of the item. This will vary from seller to seller. For the exact same item, 3 different sellers may ask 3 widely different prices. The price they ask reflects the value that the item has to them. The value of any item to any buyer depends upon how badly the buyer wants or needs the item and how much he is willing to pay. Some sellers aren't used to haggling, or don't want to negotiate, so they put the price they want in their add and there price is “firm!” They won't come down in price. A Savvy buyer learns to recognize the difference between the two types of sellers, and adjusts his offers accordingly. Never give an offer without personally inspecting the furniture. Sometimes you find pictures of used furniture online, such as on Craig's List. I would never offer a price just from a picture onlone. I can’t tell from the small pictures how worn they are, however I don’t see any obvious wear or soil spots. I can’t tell what quality they are from a picture, so I’m just going to assume that they are typical new furniture quality (lower mid range). I’m not an appraiser, but I can give you how I’d make an offer. My rule of thumb is: my top price for a used item is ½ of new price if the item is in like new condition, then I would go down from there. Before talking price, sit in the chairs. Closely inspect them and try them both out. Firmly try to wiggle the frame in all directions. See if the frame is rock solid..Sometimes one chair gets used more than the other. Are they comfortable to you? Is the foam too soft? Lift up the seat cushion. Is the deck under the cushion new and crisp, or do you see a lot of dust, etc. which indicate a chair that has been used more. Unzip the back of the cushion and look at the foam to see if it’s mashed down (indicating an older chair). Also, ask them how old the chairs are. If they are only a few months or a year old the fabric could be assumed to have more wear left in it than if the chair was 5 or 10 years old. Ask them why they are getting rid of the chairs. What is the history of the chairs? With all that said, let me give you an example. I wouldn’t make an offer without actually seeing a sofa or chair in person. As an example, let us assume that you saw a picture of a couple of wing chairs on Craig's list. How much should you pay for them. From my perspective, if these chairs were in like new quality I probably wouldn’t offer more than $100 to $150 each. (but since I’m more thrifty, I’d probably offer closer to $100 each AND wouldn’t offer even this much unless they were in really good shape AND my wife and I really want them). If they were in moderate condition, perhaps I’d offer $50 to $75 each. If they show signs of wear or soil, perhaps $25 each, or less. With that said, I’d go there and ask how much they want for the chair. Many times, if you let the other person set the price they often will ask less than you might offer, so try hard to make the other person give a price. Then, if you think it is too much, make a counter offer of a lesser price. If you really want the item, but are unwilling or unable to meet the asking price, leave your name and contact info on a card or paper with the price that your are willing to pay. If the seller is unable to sell it for their price, and they really want to get rid of it, they may call you later and accept your offer. We were asked a question if it was possible to change the style of a tufted semi-attached pillowback to be plain, like a living room chair. It depends greatly on your skill level. If you are an experience professional upholsterer you will be able to change it any way you like, and therefore you probably don't need my suggestions here.. If you have a digital camera, take pictures your recliner before you tear it apart, and also take pictures of everything you do, step by step. It will make it much easier to figure out how to put the recliner back together. But if you are an amatuer, then you should consider the following when thinking about changing the style on an attached pillow recliner. When recovering a recliner you are safer to use the old cover as a pattern to make the new cover. It is a lot less work to copy the existing style than to change the style of the backrest. If you use the old cover as a pattern (which I'd recommend), before you take the attached pillow apart, mark all the seams. For example, on every seam, draw a match-up line on every seam with a corresponding letter (A - A, B - B, C - C, etc.) on each side of the seam. These will help you reassemble the pillow back as you sew it. If the existing foam is in good shape and comfortable, you may want to reuse it. If you do decide to change the style of the backrest, I'd strongly advise that you get some cheap or scrap fabric and make up a prototype. This would save you a lot of grief later on. One of the beauties and attractions of using a recliner is the padding is generally shaped to fit your back (Lumbar support, an indent for your shoulders, and have it support your neck and head at a comfortable angle). Unless you are knowledgeable about how to shape the new foam to fit your back, you could have problems. If you replace the back padding, then the padding in the backrest may no longer fit your back and therefore not be comfortable any more. put the the recliner together and put the bare wood of the backrest on the recliner. you put the foam in place and try out how it feels. On a recliner, to get the foam in the backrest to be comfortable, you often have to layer and glue sections of the new foam to make it fit and be comfortable for your back. You'll especially want to put in some foam for lumbar support. If you are an amatuer, then you may make some mistakes (which is OK and is part of the learning process). test out how it fits. You may have to go through this whole process several times or more to get it to look good and feel comfortable for you. Sometimes, especially if you are an amatuer, you may have to make several, or more, prototypes to get the look and feel you want. (This is OK and to be expected.) Even professionals often make more than one prototype when necessary. When you have your prototype the way you want it, use it as a pattern to cut and sew your new cover. Note: on most recliners the backrest has an attached pillow back, which is assumed with the above instructions. However, if you decide to put the foam directly on the chair backrest frame, you'd first need to put burlap over the springs and staple it to the frame. (assuming that the backrest frame is straight rather than curved) Then you'd layer (cut and glue) the foam to the frame. After that you'd make a prototype to use as a pattern. The exact process you go through may vary depending up the existing style of the backrest and the new style that you want to me. It would greatly help if you had a picture of the recliner and the existing backrest. Recently I had a client vist the RV Cushions page of my upholstery business website. She said that she had some RV cushions that she wanted me to make. Since I've never done any work mail order before, I'm trying to work out the details. I'm wondering, is mail order too much trouble, or does it have great potential to add to my business. Ship Cushion covers: Remove the foam from the covers and ship 1 of size of cushion covers to use. Ship Whole Cushions: Package and ship 1 of each size of cushions to us. In some cases this might be helpful, but in most cases this is unnecessary. Plastic Wrap: Should it be shrink wrapped? Recovery -vs- Reupholstery -vs- Restoration? Some people who bring in antiques to recover just want the cover changed, they say everything else (under the cover) is just fine. To be blunt, they don't really know what the insides look like. In addition to that, the average person doesn't really look at their furniture. It's often been with them for many years and they just (want to) assume that everything under the cover "is OK". Quite often, by the time that the furniture is brought to us it has already been recovered perhaps several times. Each time before the client may have told the previous upholsterers, "Just put a new cover on it, everything else is "just fine". However, the padding and fabric tend to hide the true condition of the springs and padding to the client. Over the years the fabric, padding, support linings, springs, and webbing have been slowly aging. Here are some general guidelines to go by. When you are going to the expense of having something recovered, it would generally be safe to assume that you want the springs and padding to last the lifetime of the cover. Generally you want the cover to wear out before the stuff under it. Unless the furniture was reupholstered very recently - AND - the springs and padding were replaced or thoroughly repaired at that time, then we would recommend that they be repaired or replaced now. Look through the Picture and Slideshow section of our website and you will see that the support structure (webbing and burlap) of many of the antiques are quite deteriorated, even when they look fine on the outside. Recovering (just putting a new cover over the existing springs and padding), is only an option if the frame is rock solid, if the springs and padding are in excellent shape. If the frame is even a little wobbly, or the springs are weak, then you would at least go for the reupholstery option. Especially with antiques there is often much more work under the cover than what you can see on top. Make usable for household use? If you have an antique, should you go through all the time and expense of restoring* it, or do you just want to make it usable for your household? What is the furniture worth? It a rare piece? Would it be valuable it restored? Or it is it just a common antique? Where can you find out? What is the history of the piece? Does this particular piece of furniture (or this style) have any specific historical value? If it is a valuable piece, would it make sense to lessen it's value by just doing one of the lessor cost alternatives? OR - If it is just a common antique, would it make sense to go through the added expense of restoring it? Would the additional cost be worth it? Much of the time when clients ask us about recovering their antiques, they see their furniture in their minds as it was quite a few years ago. They see their furniture as they “want to see it”, not as it truly is today. The sofa or chair may have a fabric that is in relatively good shape where a previous upholsterer just covered over the previous upholstery. So those customers often say, “I just want it recovered. The rest of the chair is in good shape." However, the question is, have you actually thoroughly inspected your furniture? Have you tried to wiggle all the joints of the legs, arms and backrest? Once we get the cover off, and open up the padding, then you can begin to see the true condition of the sofa or chair. When you have an antique estimated, you must have the awareness that it will cost you more than you think. It probably needs more work than you expect. When determining how much work needs to be done, we go by the condition of the frame, springs, support linings, and the padding. We will not cover over the internal workings of a chair that is falling apart. How can you tell what the true condition of your furniture is? Firmly hold onto and wiggle all the major areas of the furniture (arms , back, legs, etc). Are the joints rock-solid, or do the the joints wiggle? Look under the furniture. Is the webbing still tight, or does the webbing bulge down quite a bit? When you sit on the furniture, does the seat give you good solid support. As you press down firmly all around the top of the seat, is it all firm, flat, and level, or are uneven or hollow spots. How long has it been since the chair has been reupholstered. At the time that it was done, were the springs reties, were the support linings replaced? If it has been more than possibly 15-20 years since the insides have been rebuilt, then there is a good chance the chair or sofa will need much work. The frames on antiques have had much more use and have been around longer than modern furniture. Unless the frames have been reglued lately, they may need to be glued. The frames are usually more brittle and we often have to reglue frame pieces that are loose and are coming off. The springs and padding usually need attention or repair. we have to work slower and be much more careful when tearing off the old cover and putting the new cover back on. Attaching fabric around the decorative wood involved extra work of attaching the fabric and then having to apply the trim over the fabric edges. I've heard many times, when someone wants to have a antique recovered, "I only want the cover changed. Everything else is in good shape." The truth is that no one can see what the frame and springs look like under the cover. The fabric and padding hide the true condition of the frame. A high percentage of the time, when "recovering" antiques, I end up having to strip the furniture to the frame, removing the burlap, webbing, padding, and springs, then having to rebuild everything from the frame up. Sometimes I also have to take the frame apart and reglue it. This will greatly influence your reupholstery options. If you are on a tight budget, then I would suggest that you either put the furniture away until you can afford to have it done right, or, perhaps sell the furniture, or give it to another family member, who can afford to have it done. Although you see your antique as a single piece of furniture, it is actually composed of numerous elements. In reupholstery you need to consider each part. Structural: Are all the joints of the frame solid, or are some joint loose or squeeky? To check, go over the furniture and try to wiggle every frame part. the frame Regluing and reblocking the frame as needed. Sometimes this might completely disassembling the frame and regluing, adding new blocks (as needed) to the corners. Cleaning: Over a period of years dirt, grime, and wax may have built up on the woodwork of your antique. Restoration: Assuming that the old finish is salvageable, leaving the old finish on and cleaning and restoring as possible. stripping off the old finish could lessen the value of the furniture. Type and condition of existing springs. Are the old springs in good shape; are they reusable or do they need to be replaced? Many of the antiques used the common hand tied springs, which are still being made today. Some antiques used unusual springs that are no longer being made. In this case, a decision has to be made to repair the existing springs (which usually costs more), or to replace the springs with another type of springs, or to remove the springs and use webbing and padding. Use As Is: If the springs are in good condition, just covering over them might be a choice. But in most cases this would not be recommended. Type and condition of padding. Is the padding in good shape; can it be reused? -or- does it all need to be replaced? Do you want the same original type of padding, or do you want to replace it with modern materials. Type of Materials originally used in antiques : Horsehair, tree moss, dried grass, cotton, excelsior, wood shavings. Cost of materials: In the old days when the furniture was originally made, upholsterers and furniture builders probably used whatever type of materials and padding that was common and easily obtainable. Over the years since then, methods and materials have changed drastically. That which was once common place is often now rare and hard to find, and therefore expensive. Modern materials, such as foam, requires very little extra labor to attach it to the burlap. When having antiques recovered, many clients may not care what type of padding is used in the reupholstery process. For those clients that are concerned about the padding used, here are some padding choices to consider. *Padding Note: a. When working with antiques, rebuilding the padding using the original methods and materials can be more expensive than the rest of the reupholstering process. b. The original methods, while common to the time period, were very labor intensive. Similarly, while the original padding materials were common to the time, nowadays, many of those materials aren't as common or as readily available today, so they very expensive as compared to today's padding materials. With any of these options, new padding is added over the top of existing padding if or as needed. Tacks: Most of the fabrics on antiques were commonly fastened onto the frame with upholstery tacks and a tack hammer. Some of the drawbacks about using tacks is they damage the frame. Upholstery tacks are, in a small way, shaped like the splitting wedges that are used in splitting wood. When the furniture was new, and had just one cover put on, and splitting damage wasn't noticable. But, when the furniture has been recovered numerous times using tack, this results in many tack holes in the same area. This can result in the wood in that are begin to have tiny splits in numerous areas where the tacks have been. Over the many years I've done upholstery I've seen a few furniture pieces where the wood had been damaged so badly by tacks that that wood had to be repair or replaced before it could be upholsterered. The frames of antiques can become very dry (the result of many years in a warm house) and are very susceptible to splitting, especially with furniture that has been covered many times using tacks. Nowadays, with the coming of the staple guns, fewer and fewer upholsters use tacks very much. Staples: most upholsterers and furniture manufacturers attach the upholstery fabric to the frames using staples. This is a very easy and cost effective method. There several types of staples. The type that many upolsterers use, including me, is like at very thin wire, which does almost no damage as it goes into the wood. 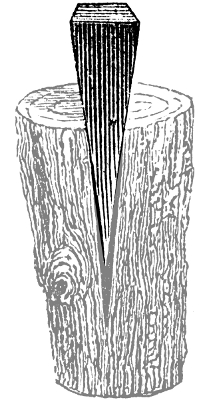 Unlike tacks, the thin legs of the staples leave the wood almost undisturbed.In the picture at the left, compare the thickness and shape of the shaft of the tack and the staple that goes into the wood. The thinner the shaft, the less damage to the furniture frame. Cost: Unless an upholsterer is very proficient at spitting tacks, using tacks adds a significant amount of time to the upholstery process. So using staples is also a cost saving feature. Preserving the Frame: An important point to remember that with antiques preserving the quality and stability of the frame is much more important that "how" the fabric is attached to the frame. While using tacks might be more "historically" true, using staples is less damaging to the frame. To Restore or Not to Restore Some points to consider before refinishing an antique. Reupholster Using Common Materials: Since the original makers of the furniture used the common material they could easily find, have the upholsterer likewise use the common materials that are available today. When you own and care for an antique, you are steward of a relic of the past. What are your responsibilities to the past and to those who will own the furniture in the future. The basic premise of an antique is that it had a life (of sorts) before you owned it and it will probably have a life after you. Recovering: taking the old cover off and putting a new covering on. Reupholstering: Often used synonymously with Recovering, but in a deeper sense, can be defined as doing a more thorough job, include frame rebuilding, retying springs, adding new padding, etc. In some applications, such as in restaurants that have their booths covered in vinyl, vacuums and floor polishers can run into the corners of the booths and cause damage. How do you protect those corners from getting damaged? I was asked if there was some type of clear plastic corners that just screw on. This was my answer? Here are some [url=http://www.usplastic.com/catalog/search.asp?search=corner+protectors&x=0... Butyrate Corner Guards[/url] . Here are lots of pictures of various Corner Guards on Google . Flip through the pages of picture until you find what you like. Here is another type of Clear Plastic Corner guards. Here are [url=http://www.wallprotex.com/corner_guard/]more corner guards[/url] . And here are some more [url=http://www.complast.com/CORNERGUARDS/index.htm]Clear and Colored Corner Guards[/url] . Use some leather, such as tool belt grade leather to put on corners. You can use decorative tacks or screws to hold it on. [url=http://shop.marshcouch.com/picture?table=options&pic=530402&width=80&hei... this example[/url] . Paper and Packaging companies have a [url=http://ronstanpaper.dynamiccatalog.com/UDS_OC_DC/dspdetails.asp?ID=2063&... protector like this[/url] . Here are some [url=http://www.cheap-homefurnishings.com/item/42590196/Kidco-4-Pk.-Soft-Corn... Corner Products[/url] . Perhaps some metal corner protects, [url=http://images.google.com/imgres?imgurl=http://www.handyltd.co.uk/images/... this[/url] , would do. Check with your local janitorial supply companies. They often sell corner protectors. Ask local Janitor and house clearning companies where they get their corner protectors. A very real part of the upholstery trade is taking off the old and putting on new. This leaves us with a need to dispose of: old covers, old foam and old cushion, scrap foam, etc. Since we've bought and moved into a house in a small town, I've wondered what to do with the old stuff. Since I've had to get a new foam supplier who charges a huge difference in having to cut foam, I've been cutting the foam myself. As you know, that leaves a lot of foam scraps. My new foam supplier doesn't pick up and recycle the old and new foam scraps like the old foam supplier did. I've also attached a picture of those two ads below for when the listing will be canceled in a day or so. I had just put the ad up for the free foam scraps when someone called me not ten minutes later. She came out tonight and took all my old foam and my foam scraps. Her daughter is making a large wearable teddy bear. I also had someone call me about the dining seats. He said that he will come get them tomorrow morning. Both of these came out from the large city of Salem to small Independence. This isn't the first time I've gotten rid of stuff on Craig's list. I also gave away an old wood shed that I was about to haul to the dump (and pay the disposal fee.) The person who picked up the old shed was very thankful to receive it. I've given away other old cushions when I made all new replacement cushions. I've given away old foam when I had just replace the foam in cushions. It seems like there are people out there who are tickled to death to haul away our refuse. Should you use a Skirt Stiffener? To answer the question of whether or not to use a stiffener, you need to look at the purpose and use of a stiffener. Whether or not you need a stiffener often is determined by the type of fabric, the method of skirt construction, and the type of furniture that has the skirt. There are several methods for making a skirt. smoother. You can get Skirtex (Skirt stiffener) at many upholstery suppliers. In any case, having the skirt stiffener is very helpful. Another method of making skirts. In recent years I have learned to staple the welt onto the furniture separately, then to put the skirt flaps on individually. Since the skirt flaps are just a piece of fabric folded over, the only seams in the skirt flaps are just at the ends. By carefully stapling the flaps on individually, it is much easier to have smoother hanging skirts, thus mostly eliminating, or minimizing the need for a skirt stiffener. However, a skirt stiffener may still be needed in some cases. I generally haven't used skirt stiffeners because folding the fabric over serves a very similar function as the skirt stiffener. Also, because there is no seam along the bottom of the skirt, the skirt is much smoother and has less need for a stiffener to keep it straight. I'd say, if you want to use the stiffener, go ahead. It is very helpful. When using the stiffener, you don't need to sew it into any seams. Just put inside the skirt to hang loosely. The make the skirt long enough (or cut the skirt stiffener down) so that it doesn't get sewn in the top seam. The height of the stiffener should fill almost the whole height of the skirt, but just a bit short so that the skirt will fold over at the top. Protecting your flooring investment and maintaining your carpet will promote a healthy, clean indoor environment. Here are a few quick and simple ways to keep your carpet and flooring up to par. Vacuum your carpet regularly, especially in high traffic areas. Approximately 75 percent of soil in carpet is dry and can be removed with the vacuum cleaner. Use a vacuum with a beater bar that is set to the correct height for your carpet pile. If the setting is too high for your carpet, you may not be removing much soil. If it's too low, your carpet will take a beating. Changing the direction of the vacuum cleaner frequently will make vacuuming more effective. Regular vacuuming will improve the overall appearance of the carpet and protect your investment. Change the vacuum bag for goodness sakes. A vacuum cleaner can plug up and lose most of its efficiency just by allowing the bag to become too full. Most bags will have a line about one-third from the top. You should not allow the bag to fill above this line before changing it. Have your carpet professionally cleaned on a regular schedule. Most of the large carpet manufacturers suggest having the carpet cleaned every 12 to 18 months. The frequency will depend on factors such as: number of pets in the home, number of children in the home, and the level of traffic that the carpet receives. If you have newer carpet be sure to read your warranty. Many of the carpet manufactures are starting to specify how often you must get it cleaned in order to maintain its warranty. Many also state that the cleaning must be performed by an IICRC certified cleaning company. Deal with the spills and spots as soon as possible. Proper spotting technique goes beyond the scope of this article, but when in doubt stay away from harsh over-the-counter cleaners which can sometimes set the stains and create a more permanent headache. Use entrance or walk-off mats in each of the homes outsides doorways. This will significantly reduce the amount of soil that is tracked into your home. The larger they are the more effective they will be. Don't forget, you must clean these mats regularly as well. Reapply Protective Coating Regularly. Most carpet gets a protective coating applied to it during the manufacturing process. The purpose of this coating is to give it some stain resistance. Over time this coating will out due to factors such as: foot traffic, furniture, pets, spills and cleanings. If your long-term goal is to keep your carpet looking its best, it is important to have this coating reapplied on a regular interval. Avoiding soil filtration stains. Have you ever been in a home that had dark stains in the door ways of rooms and/or around the baseboards? These are usually known as filtration stains and are caused by air rushing through the carpet fibers and leaving behind some stuff that is floating around in it. The carpet in these areas is simply working as an air filter, collecting the oil, smoke, dirt, dust and anything else that may in it. One of the best ways to help minimize this problem is to make a practice of keeping the internal doors open. This helps to equalize the air pressure through-out the house and slow down the air movement in these areas. Avoid walking on the carpet with dirty shoes and even bare feet. Walking on the carpet with clean socks is one of the best ways to keep it dirt and oil free. Today I'm repairing a couple of feather throw pillows. The pillows match the client's sofa, which she has had for about fifteen years. Because the feathers are coming throw the covers, the client wants to have the feathers replaced with a soft dacron filling. As I take the down ticking inner cover out of the outter cover, the multitude of feathers that escaped the ticking cover are all over the inside of the fabric cover. Because many of the feathers are stuck to, or starting to penetrate the fabric cover, the job of simply replacing the filling becomes more complicated and time consuming. It is a tedious task of pulling each feather loose from the cover. Consequently, I realized that I should have charged more for this job. However, when I took in the order I hadn't even thought about it being more work to restuff a feather throw pillow. As I thought about that, I had an idea that this is a valuable bit of knowledge, but there's not enough information here to write an article. It's just a little tidbit of knowledge that would be useful to know. With this came a realization that there are a lot of little tidbits of upholstery knowledge that would be good to remember and to share. These tidbids need to be easy to share and easy to find. So, I'm thinking about what would be needed to set up an "Upholstery Tidbits" section on this website. Perhaps something like a "classified adds" module, that is customized for this use, might be workable. I'll have to do some research and see what I can find.